A NEW MEDIUM IN ART. BUILT FROM RHYTHM. Join the interest list to receive exclusive information on all upcoming events relating to Chad Smith’s artwork. In this short video, drummer Chad Smith discusses the creation of his art collection Parallax and what viewers will see from this new medium. Available on December 4, 2015 at www.chadsmithart.com, the collection features 13 different works of art, each limited in addition, numbered and individually signed. Titled “Parallax,” Chad Smith’s art debut is the musician’s foray into the rhythm-on-canvas medium. Working with SceneFour, the art team responsible for the medium, Smith’s collection features 13 different works, all of which are built through an extensive process to visually harness Smith’s preternatural drum skills, previously seen only through sound, now rendered visible. Using lit drumsticks in much the way a painter would brushes, Smith crafted the visuals within the work through rhythmic performance. Then through an extensive process at SceneFour’s Los Angeles studio, the captured rhythms are worked with to bring out the abstract visual before the are laid to canvas. limited-edition pieces, all numbered and individually signed by Smith. A portion of all proceeds will benefit Camp Korey (campkorey.org), a charity for children with serious medical conditions. 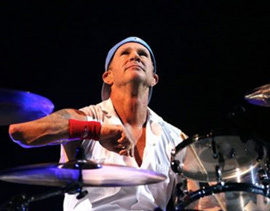 Drummer Chad Smith will be unveiling an art collection on December 4, 2015 of rhythm-on-canvas. 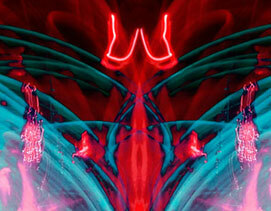 Working with art team team SceneFour, the collection is vivid, abstract, and will available to collectors worldwide. To learn more and access the online pre-release, sign up at www.chadsmithart.com.